We started the month off strong with our 2016 book awards shortlists and the winner of the 10th annual Sheri-D Wilson Golden Beret Award for Spoken Word! Thanks to everyone who helped us celebrate all the great poets shortlisted for our 2016 book awards, including CBC Books, 49th Shelf, Open Book Toronto and many many more. Throughout the month, we chatted with each of the shortlisted authors. Meet Chad Campbell, Cassidy McFadzean and Sarah Tolmie; Raoul Fernandes and Armand Garnet Ruffo; Melissa Bull and Ben Ladouceur; Rachel Rose and Derek Webster; Adebe DeRango-Adem and Bruce Meyer; Lorna Crozier and Maureen Hynes. Find all of the Meet the Shortlist series here. We also sat down with the 2016 Golden Beret Award winner, RC Weslowski, to chat about performance, inspiration, and fond memories. We used our blog to take a virtual road trip across Canada, visiting small presses, reading series, literary magazines, and festivals taking place in all the nooks and crannies of our beautiful country. Hope into our car with us and visit the Atlantic provinces, Quebec, Ontario, Manitoba, Northwest Territories and Nunavut, Saskatchewan, Alberta, BC, and the Yukon! Find our entire road trip here. Guest writer Alessandra Naccarato joined our blog to write about travel and leaving as she prepared for (and departed on) a cross-country poetry tour. Guest writer JC Bouchard kicked off the month with a great essay about not writing. We sat down with some members of the 2015 Toronto Poetry Slam team to chat about travelling and writing in groups. We celebrated Poem in Your Pocket Day in Canada for the first time, thanks to an amazing partnership with the Academy of American Poets! We welcomed a new Executive Director to the team! Our Mayor’s Poetry City Challenged was accepted in city halls large and small across Canada. Events took place online and across the country. 49th Shelf shared our list of 10 road-themed books of poetry. Let poetry take you on the road! The Walrus put together a band of poets who participated in a series “covering” T.S. Eliot’s poem The Waste Land, whose famous line “April is the cruellest month” is inspiration every year for NPM. Open Book Toronto kicked off the month by sitting down with some of their favourite poets who, in turn, recommended some of their favourite poets. The Winnipeg Free Press celebrated by featuring 20 Manitoba poets throughout April–that’s one for every weekday in April! All Lit Up went above and beyond this year for NPM, creating an incredible interactive constellation of 131 Canadian poets. Each week they also sat down with some of these poets to talk about new books, inspirations, and more. We also loved this feature, where eleven poets of colour tell us about their favourite poets. CBC Books rounded up 15 must-read collections of poetry, and also opened submissions to their annual Poetry Prize! Many many book awards (shortlists, longlists, and winners) were announced throughout the month, including the Griffin Poetry Prize shortlist! Bill Murray presented some of his favourite poems for O magazine. We even got to talk about Beyonce. And today is Authors for Indies Day, which is the literal best way to close off this, our favourite month of the year. Stay tuned next week–National Youth Arts Week–for our announcement of the winners of our 2016 Jessamy Stursberg Poetry Prize for Canadian youth! 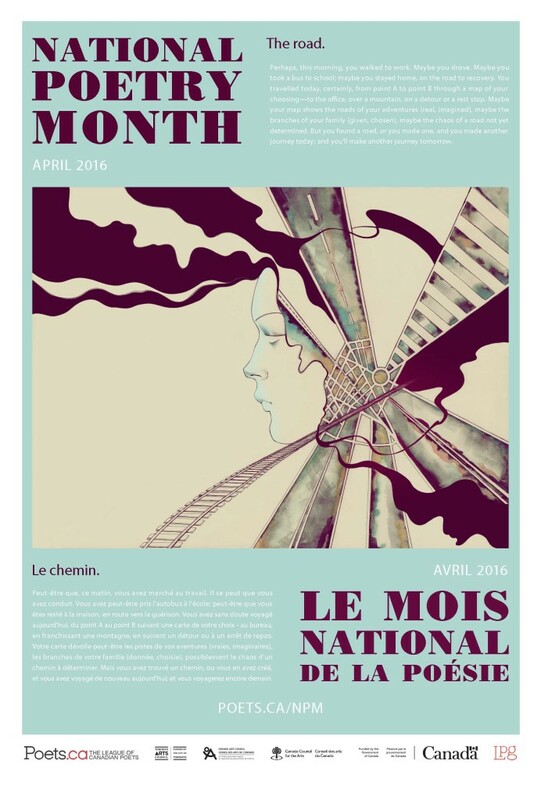 Thank you to everybody who participated in National Poetry Month this year, whether it fit with our theme or not, and thanks to everyone who shared the word about our initiatives! To find archived information about our 2016 theme, including our visual materials, click here. We’re already thinking about next year! See you in 2017.